I’d have to say, I totally agree with that. Not only has the weather been lovely and sunny, we’ve been able to spend a little more quality family time together recently and it has been wonderful. 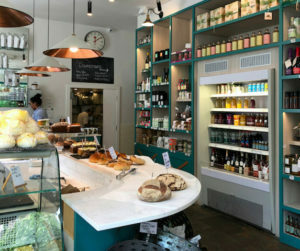 One of our new favourite spots is The Corner House in Brook Green. The name says it as it is. A house located on the corner of a street. But it’s more than just a house. It’s a cafe. It’s a restaurant. It’s a place for families – one that most don’t want to leave from. Whilst it appears to be small from the outside, it’s not and there’s an array of things to do inside. From the moment you walk in, you know can… Relax. Yes. Even with kids in tow. Oh and don’t even get me started on decor – it’s beautiful. Even my husband, who isn’t into interior design, loved it. It was modern, classical, fresh, trendy and inviting. Each room different and offering so much. Exercise classes take place in their downstairs studios and whilst they go on, children are free to play and believe me, they’re totally spoilt for choice with activities. 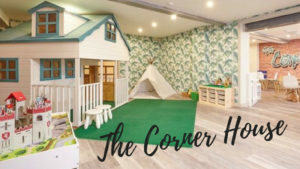 Ride on cards, a massive (2-storey) play house with bean bags, a reading corner, endless fancy dress options, skittles, a toy kitchen, puzzles, games, an infinite choice of toys – a child’s dream!! And a parents too. H played happily for almost 90 minutes whilst I took a yoga class and my husband sat on his laptop in the seating area next to her. Talk about productive. Following my exercise class we headed back upstairs and sat in the restaurant for brunch. 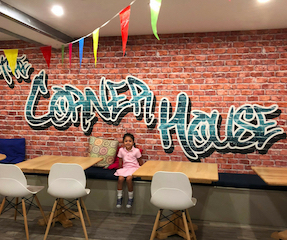 A fantastic menu with plenty of options for both adults and children. The food was absolutely delicious and went down a treat. We’ve already told a number of our friends to check it out and looking forward to going back very soon!